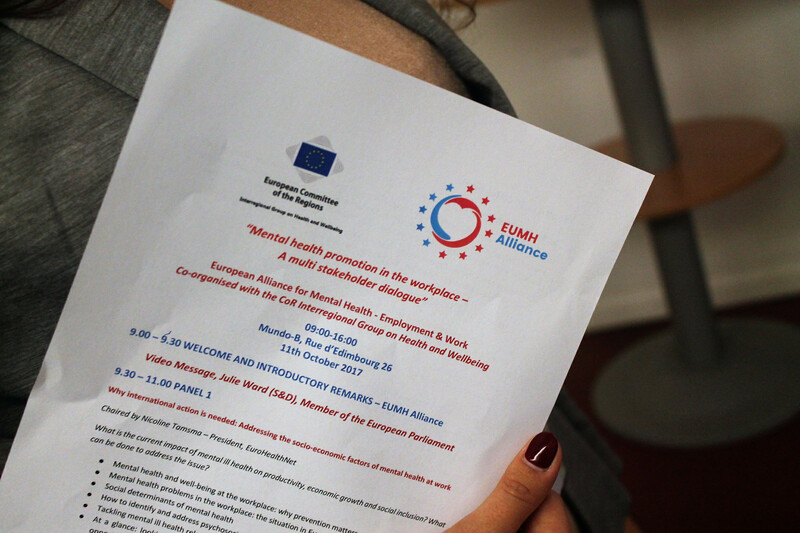 On 11th of October, EUREGHA co-organized a full-day conference on the topic “Mental Health in the Workplace – A multi-stakeholder dialogue” in cooperation with EUMH Alliance (European Alliance for Mental Health – Employment and Work) and the Committee of the Regions Interregional Group on Health & Wellbeing. The conference gathered over one hundred participants to discuss how to promote mentally healthy workplaces between employees, employers, users of mental health services and human resources specialists. Nicoline Tamsma, president of EuroHealthNet, introduced the conference and chaired the first panel discussion on the topic: “What is the current impact of mental ill health on productivity, economic growth and social inclusion?”. David McDaid from the London School of Economics and Political Science, presented the importance of the workplace from a public mental health perspective: “We do not leave our bad or good mental health at the workplace, we bring it with us”, he explained. Mr McDaid also presented data of the current situation on mental health problems in the workplace in Europe, which shows that nurses and health professionals have highest rate of reported depression, stress and anxiety in the United Kingdom. There are also regional differences in sick leave due to mental health problems within European countries. Mr McDaid explains that workplaces that manage “difficult customers” such as pupils and patients, are the workplaces at which employees have highest risk for developing mental ill health. According to EU-OSHA, in the European Union alone, work-related ill-health and injury costs €476 billion every year, which could be saved with the right occupational safety and health strategies and used for promoting wellbeing and positive mental health. As Brenda O’Brien from EU-OSHA explained “the main reason for companies to address health and safety is to be compliant with the law, it is not about altruism”. Harmonization of minimum occupational health and safety standards throughout Europe is needed, as well as a better understanding of why it is beneficial to invest in mental wellbeing at work. There remains a lack of understanding and implementation of existing legislation on mental health in the workplace, and participants recommended more and better guidelines on how to interpret existing requirements. Ms Vanessa Zurkirch, Regional Center of Reference for Relational Criticies from Tuscany Region, raise that social relationships are an important protective factor in a stressful environment, which is why we need to focus on strengthening the social relationships in a workplace. Ingibjörg Jonsdottir, professor at the Institute of Stress Medicine from the Region Västra Götaland, concluded that mental health promotion and prevention in the workplace is mainly about organizational and structural changes, and most importantly needs to be addressed on a management level rather than individual. Ms Jonsdottir explained: “The challenges are more about the workplace and how work is organized and less about “mindfulness”. Stigma and self-stigma also have a huge role to play in promoting mental health-friendly workplaces. “For most people experiencing mental ill health, the stigma attached to it is even worse than the mental health problem itself” explained Anita Hubner, Mental Health Ambassador. Bob Grove, Senior Policy Advisor, Mental Health Europe ended the conference with the concluding remarks that mental health at work should be considered as an asset rather than a risk. Healthy workplaces is something that all employers should aim for, and work for. Watch MEP Julie Ward’s video message HERE.